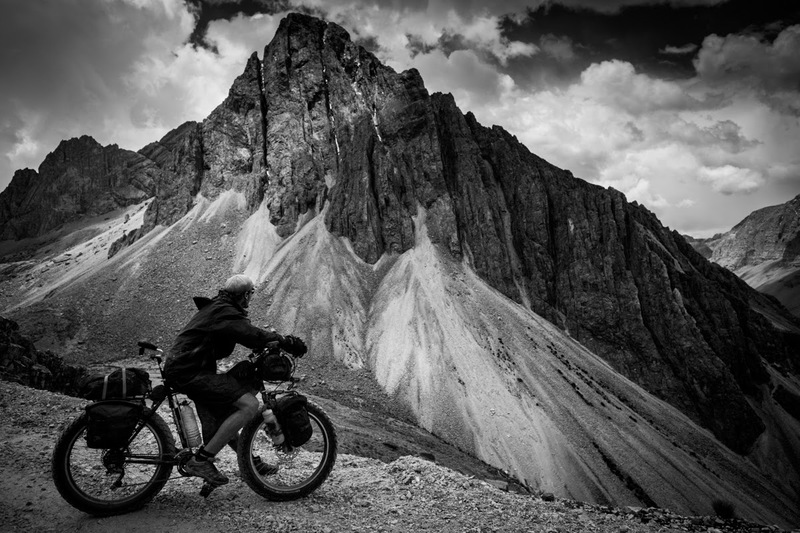 You hear alot about cycling the infamous Bolivian "Death Road" (Ruta de la Muertos). Vans loaded with bikes and gringos go streaming out of Lapaz every day. That old road chipped from the sheer cliff side sees thousands of bikers every year. The scenery is absolutly stunning (when its not hidden behind grey walls). Though, if you are a true, blown in glass Mt. Biker and crave single-track like a polar bear does seals? You might very well find yerself board to death by the "Death Road". I only compare these routes because they start and end in virtually the same place, taking different valleys. The ever amazing Christian from the Lapaz Casa de Ciclista gave us a lift to the Choro trail head. This trekking path is normally hiked in 3 days. We planned to do it in 1 on bikes. From a lofty 4870m down to a balmy 1300m- a decent of 3570m (11,712ft) How challenging could it be? Only ancient Incan roads to be found here. Gabriel, starting to feel it. I only had 50 Km on my odometer but it took us 12.5 hours of hard effort. We finished the last stretch in the dark. Head lamps sweeping the fast and rocky decent to Chairo. Amazing and difficult. We shared a beer and some hearty cheers all around at the end of a beautiful days ride. Don't expect a T-shirt. I highly recommend this alternative route to anyone with a hankering for the unbeaten path. A light weight bikepacking set up and breaking it into a 1.5 day run would be the most ideal. Be prepared for some serious hike-a-bike. The rideable stuff is in the beginning and the end. He bucked and kicked wildly. I had to throw a tarp over him to get him in the truck. Through out the drive back, I had to keep reassuring him it was only a side trip; so he wouldn't destroy the sideboards. Hey Kurt it's seven, Amazing post. I'm working towards building a bike right now. Your doing what I dream of doing. Luna's laying sprawled out on my body right now, little stinker. Hey Seven, Great to hear from you. What'cha gonna build? Road or MTB? I'd like to meet that little stinker one day. She'll prolly be riding with you by then! That mud looks SERIOUS! The fat bike appears to be doing it's job as an all terrain vehicle. Thanks for sharing your adventure with us. I'm positive they do. It gets group to seem. Good or bad, these bicycles aggravate a rejoinder, and in my book that's improved than a tedious backyard :-). Really it is amazing post. You have share many kinds of beautiful place for riding mountain bike. Really it is perfect for cycling.